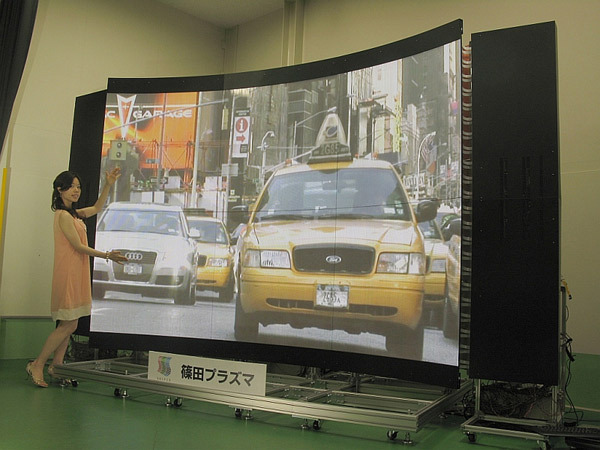 Japan-based Shinoda Plasma [JP] has developed a plasma TV that’s 2 meters tall and 3 meters wide (145 inches), which is quite obviously able to show life-size images of (most) people. The spectacular display will be sold as part of digital signage or teleconference systems. The TV can be attached to curved walls and is supposedly more eco-friendly than conventional plasma displays that are on the market now (the power consumption varies between 800W and 1,200W). It features a resolution of 960×720. Shinoda Plasma says it expects sales of up to $35 million in the next fiscal year. The company says that buyers should be ready to shell out $50,000 per sqm for their flagship TV. It just recently showcased a plasma display boasting 1mm thickness. Shinoda-san, the man behind Shinoda Plasma, left Fujitsu in 2005 after that company stopped producing plasma displays.